Left to right: Dave Frantz, Kirk Donges, & Todd Jenkins working with the plans of the Athletic Complex. 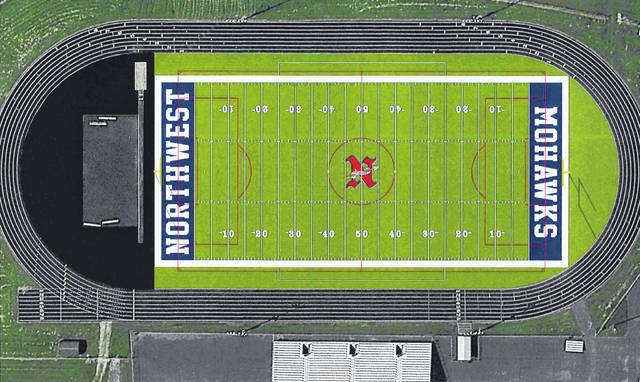 What the Northwest new turf field is proposed to look like come this football season. Northwest’s old concession stand is torn down to begin working on the new complex. Site where the new concession stand and ticket booths will be, you can see Northwest High School in the background. Ducks would have had more fun on the old Northwest football field, where the official ground breaking was to take place Thursday. On what was to be groundbreaking day for the Northwest Athletic Complex and field, turned out to be just a preview of what will soon be, one of the finest athletic complexes and fields around the area. 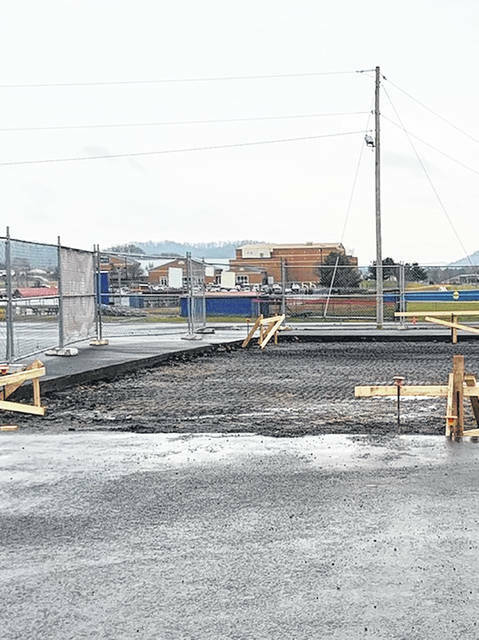 Todd Jenkins, Northwest Superintendent, said that due to the cancelling of the groundbreaking, they will make plans for a ribbon cutting type of ceremony in the fall, when all is complete, and the students can walk out on the field. 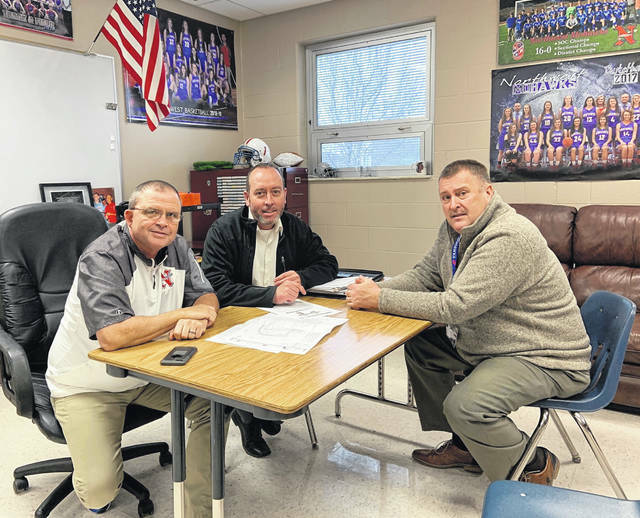 Jenkins, along with Dave Frantz, Northwest Athletic Director, and Kirk Donges, Architect for TSHD, gathered to discuss some of the great things happening in the building of Northwest’s Athletic Complex and Field. Donges said that once they were hired as the architects, they just did little changes, such as the footprint of the building to make it fit the site better. “We just re-arranged the pieces of the puzzle essentially, now all the locker rooms will be off directly to the field,” Donges said. “The track teams both boys and girls will share the same locker rooms as the soccer teams in the Fall.” Donges continued that the concession stand is already under construction, the ticket booths will be in with the concession stand. The old concession stand has already been torn down. 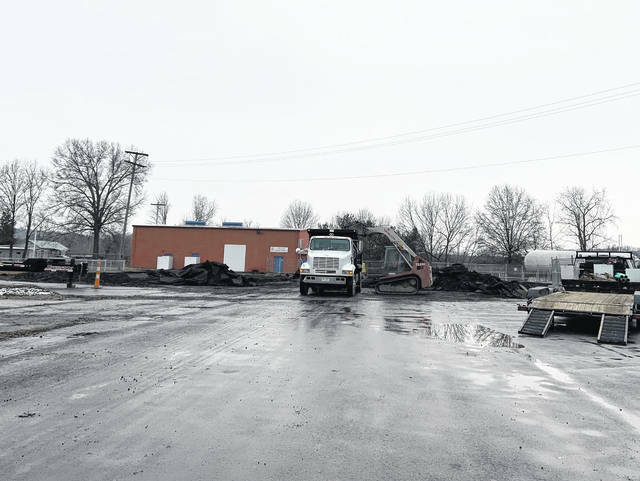 “It’s a privilege to be able to come back to a district where you have done work before and help them improve the facilities even further, to continue our work with same client as before.” Donges said. Jenkins said they have both boosters and a lot of their parents that work concession who are thrilled to be able to work in a facility that Donges says is probably four times as big as their old one and they have been discussing with them what works for them and what doesn’t in the concession area. He added that not only will all the facilities be nice for both home and visitors, but they will have very nice restroom facilities and then the new visiting bleachers will house 600 people. He added that there is to be a sidewalk that they will walk and that the concession stand will have sales on that end.